Your business creates and receives thousands of documents and emails every week. You need a fast and simple filing system that is logical both today and in years to come. Protect sensitive documents – control access to Folders containing restricted documents and email. List-based filing ensures fileplan works the way you do. Create Lists for clients, jobs, projects, matters, assets, policies or any other purpose. Control who can make changes to the business filing system. Create the Libraries, Lists and Folder templates you need quickly and easily using terminology familiar to your team. With no limit on the number of Libraries, you can create one for each specific function in your business. Folders make fileplan intuitive to use. Set up templates to ensure a consistent Folder tree is automatically generated each time a new client, project or matter is added. You can also add Folders individually. Information silos exist when individuals control access to information. fileplan helps you break down one of the biggest silos in any organisation – personal folders in email inboxes – to create a single point of truth for all your business information. 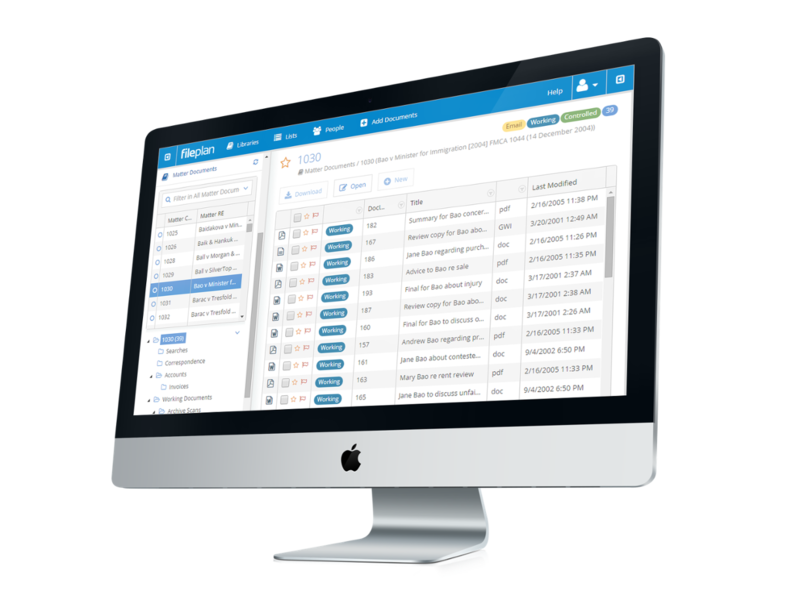 fileplan automatically classifies every document as either Working, Email or Controlled. Document profiles contain over 40 data fields, making it easier to organise and find your documents when they’re needed. fileplan integrates into Microsoft Word, Excel, PowerPoint and Outlook so documents and email can be captured without any extra burden on the user. Saving email against the right job or project has never been easier.